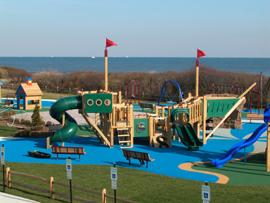 Over one million children play on our playgrounds every day! We are grateful for the opportunities we have to touch so many children’s lives in safe, supportive, and joyous ways. We wish children could return to the original playscape of the forest, the fields, and the countryside beyond, where occasions for incidental exploration, in the midst of adult enterprise, made play part of the life that was going on all the time. Children experience so much more than we are willing to admit that it is hard to see how any planned environment can provide them with sufficient challenge and space in which to grow. 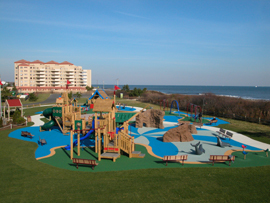 Playgrounds are not self-cleaning ovens that, once installed, are guaranteed to perform in predictable and maintenance-free ways. Playgrounds require the supervision, ingenuity, and responsiveness of caring adults. A playground fulfills its mission best when it becomes a catalyst for group cohesion, for a community to get to know itself as it addresses the needs of its families and children. 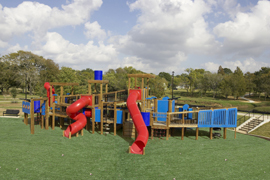 Only then do we, as playground designers, fulfill our mission of supporting the social, emotional, and intellectual, as well as physical dimensions of a child's growth. 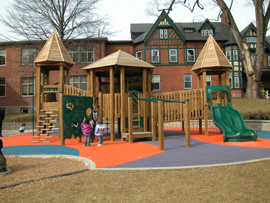 The PlayWood Plus line of wood playground equipment from PlayVentures, Inc. provides us the opportunity to design and build play environment of any scale, large or small, that truly meet the needs of the children for whom they are being designed. The variability of the available platform sizes, as opposed to a system of identical size platforms, prevents repetition and uniformity of the PlayWood Plus playstructures. This allow us a playground designers to make them capable of being tied into a landscape, adapted to a site, wrapped around a tree, etc. 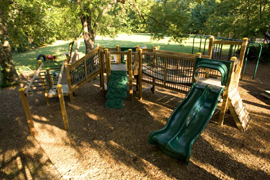 More importantly, the range of over 100 play components of different shapes and sizes, made of wood, steel or recycled plastic, varies the connections between the platforms and the ground, the ways in which children go from high to low, and the ways they get on and off the structures. These possibilities for choice allow us to respond to the needs of each age group specifically and simultaneously. Most components are designed with a simpler version for younger children and a more difficult version for older ones, so all ages can do the same thing at their own performance level. An exceptionally large number of movable parts satisfies every child's fundamental need to move and to interact with a responsive environment. 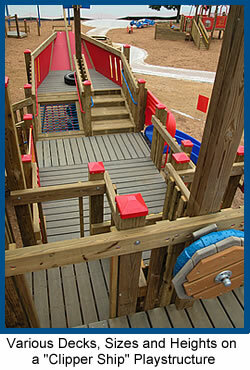 Modularity and expandability enable the design of simple or complex play units. It provides a graduated series of challenges for different ages and for children returning to a structure time and time again. They also ensure that structures can be upgraded as circumstances dictate and funding permits. The Playwood Plus product line from PlayVentures, Inc. allows us to develop a truly original play environment custom designed to meet the needs of the children in your community, organization, or facility. 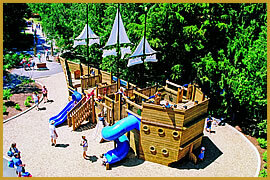 Please contact us directly or feel free to check out the PlayVentures, Inc. website at www.playventuresinc.com for more detailed information on the wide variety of high quality PlayWood Plus playground products manufactured by PlayVentures, Inc.